TL;DR I’ve gone through dozens of methods of weekly planning, goal-setting, and journaling. In this post I talk about some of these methods and then share the newest way I’ve been planning and journalling using Evernote. My method incorporates goal-setting using an OKR (objective and key result) framework, organizing tasks based on importance and urgency, and journalling complimented by tracking habits like sleep and exercise. Skip to the end of the post if you just want to download my Evernote template for weekly planning and journaling. Beginning in middle school, I used the standard school agenda with organized sections by class (something like this, if don’t know what I’m talking about). This worked well when classes were the only thing I had to keep track of (I sometimes wish this was still the case). But, by college, my schedule had become more variable and a lot of my work no longer fit neatly into subject boxes. I had part time jobs, meetings for student organizations, research, and volunteering commitments that all varied on a weekly basis. I started to use a combination of two methods for planning: I kept a note on my phone to keep track of assignments and exams and started using iCal for scheduling lectures, blocking out time to study, and keeping track of work and volunteer responsibilities. Towards the end of my undergrad, I decided I wanted to start journaling. I tried a bunch of different methods, e.g. writing one sentence a day, a photo journal, bullet journalling. All of these failed because every time I missed a day or my journalling looked too messy, I felt guilty (I know this is super over-critical but that’s just how my brain works sometimes)! Eventually, I realized that I needed a set-up that would allow me to write when I wanted, but also looked okay to me if I didn’t. An example of my old planner/journal spread. This is from a time when I wasn’t in school or working, so I was just keeping track of things like progress on some Coursera courses I audited and applying for a student visa for the UK. I blocked out most of the “journal”/memories part cause it’s stuff I don’t want all over the internet. In an effort to keep my weekly tasks and daily to-do lists, I started writing everything in my Moleskine. Taking a (tiny) bit of inspiration from bullet journalling, I added a “tracker” to keep up with patterns in my habits and mood. I also continued using iCal to keep up with weekly meetings, classes, etc. I used this method on and off for a couple years. It took me until this summer to come with a new method, but I’m so happy with what I’ve put together, I wanted to share it with everyone! After years of using the method I described above, it took two major things for me to switch it up. First, I have been in a serious rut lately, particularly with my work, and my old planner just wasn’t cutting it. I was unmotivated in everything I was doing; doubting my ability to finish my PhD; and stuck in a “paralysis by analysis” situation. Second, I read the book Measure What Matters, which had been on my reading list since Bill Gates reviewed it here. In Measure What Matters, the author and venture capitalist John Doerr writes about how the management system of objectives and key results (OKRs) has been used to help some of the top organizations, from Google to the Gates Foundation, achieve success. While the focus of the book is on how OKRs work and how they can be applied to help any organization succeed, I took a bit more liberty with the idea and decided to apply OKRs to my personal work1. Set ~5 objectives for each quarter. An objective is what is to be accomplished. Most of these objectives (3 or 4) will be committed objectives: things I have to finish. The last 1 or 2 objectives will be aspirational: things that I would do in an “ideal world”, but that I don’t necessarily have a clear plan for. For each objective, set 3-5 key results. Key results “benchmark and monitor how we get to the objective”. KRs must be measurable. If all the KRs are complete, by definition the objective must be met. OKRs should be evaluated and “scored” at the end of a quarter based on whether and how well they were achieved. OKRs are carried over to the next quarter if they were not achieved but still relevant. After downloading Evernote to document out my OKRs, I immediately fell in love with the simplicity of it’s layout and started thinking about all of the other things I wanted to start using it for, including my weekly planner/journal! I’ve kept the basic ideas behind my old weekly planner, but added an additional productivity tool: organizing my task list into an urgent-important matrix, aka the Eisenhower matrix. The idea here is to add some rationality to the order of your work and combat the bias we have to prioritize urgency over importance. Typically, people will advocate delegating or eliminating work that’s labeled as “not important”, but as a PhD student delegation is almost always not an option (I’m the person that people delegate to!). So again, I’ve added a twist: I’ve re-labeled “not important” as “less important”. I consider tasks in the “less important-urgent” category things I need to do, but shouldn’t spend much time on. Tasks in the “less important-not urgent” category are I should do only if I have free time. As always, I’m complimenting this weekly planner with iCal to manage my time day-to-day. Some example tasks in the urgent-important matrix. I classify reading a paper urgent and important because it’s the subject of a meeting I have on Friday. Data cleaning for one of my projects is important, but less urgent because there is no hard deadline and the recipient of the output is currently out of town. Emailing Paul is not super important, but pretty urgent because I want to generate a list of conferences I’m interested in and don’t want to miss an application deadline. Writing a blog post is something I do in my spare time, so it’s not really urgent or important in this framework. Making my planner on Evernote has also helped me create a prettier habit tracker! I fill in each box with a value and/or color. The colors help me visualize my progress at a glance: mostly green means I’ve been doing well, more yellows, oranges, and reds are things I should be more aware of. The values I place in each box give more details behind the colors. If something was particularly bad/good I tend to write about it in my journaling section. Example of the habit tracker I’ve come up with. I monitor things that I know tend to correlate with my mood. Some things I aim to keep “green” all the time, like sleep, while others are things I do pretty rarely, like art, but are still things I want to keep track of. Of course, you can modify the rows to fit your own needs. It’s only been a couple weeks since adopting this new system with Evernote, but I am seriously loving it so far. I hope y’all love it too, or at least use this post to get some ideas to update your own method of planning. Click here to download. Import the file into Evernote desktop by navigating to File > Import Notes and selecting the WeeklyPlanner.enex file you’ve downloaded2. 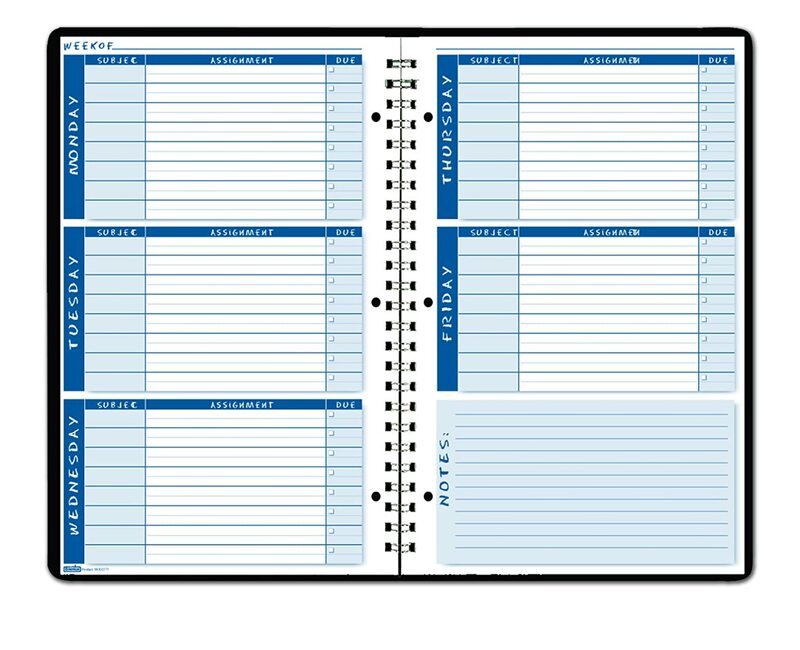 Have a more organized life – use a weekly planner!